Before you start guffawing about the un-seasonality of pesto in December, hear us out. The purpose of having a basil plant in your window box, is to make pesto in July. The purpose of Roberto Panizza is to spread the flavors of true Genovese pesto all over the world during the holidays, kind of like Santa does for toys and joy. Although Roberto Panizza is a generally jolly guy, he is more of a King archetype than a Santa. 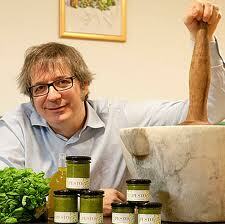 In fact, he is the reigning King of Pesto! Like any King he has strong opinions. He is very opinionated about what goes into his pesto and what does not. His pesto contains 7 ingredients all produced in Italy: DOP Basil from Genova, EV Olive Oil, Slow Food Presidium Garlic, Sea Salt and the 3 Ps (Parmigiano, Pecorino Sardo, and Pine Nuts). For Christmas, Gustiamo has imported a very limited supply of Pesto Rossi into the USA, ready to ship to your door. We firmly believe that this it the only way one could and should incorporate pesto into winter-time feasting and gifting. Pesto + Lasagna is a very special combo! Thanks Paola! And when fresh basil is nowhere to be found, there is Pesto Genovese Rossi, a shortcut but not a quality-cut.